I love this time of year...the chill in the air, the hustle and bustle and all the happenings! First off, today is the last day to sign up for the Lovely Package Workshop this Saturday at our studio, hosted by Oh, Hello Friend. 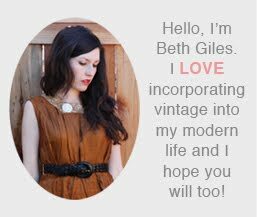 It's going to be great, Danni has the best vintage style ideas for everything! You can sign up here. The following weekend, Salvage Life will be selling at two local shows. The first is Unique LA, we've been selling here for a few years now and it NEVER disappoints. There is great music and food and with over 325 vendors, you are sure to go home with lots of unique gifts! We will be filling our booth with vintage clothing, accessories, housewares, decor and ephemera. I'll be sharing some photos of the merchandise you can expect to see on the blog next week. The second show is A Current Affair and it's only a block from Unique LA. The show is all vintage and it's the best of the best local vintage clothing and accessories dealers aimed at a fashion forward crowd. I'm so excited to be a part of this show for the first time! So, get some girlfriends together and make a day of it! Plan to visit both shows and support local businesses by buying some one of a kind Christmas gifts! There have been some requests for a Holiday Sale at the studio which I have been considering doing. If so, it would be Saturday, December 10th. If this interests you, let me know and I will do my best to make it happen!